On the 1st of February Neopets updated everyones User Lookup to contain how many Key Quest Token's people have collected. Other icons on your lookup have also been updated. Some people have noticed that their lookup shows "Key Quest Tokens: 1 (1 unique)" but haven't redeemed a prize code. This is a glitch on Neopets part, visiting your Collector's Case will reset the count to the correct value of 0 (0 unique) since there are no tokens in there. If you do have tokens, you can use your Collectors Case to see all the tokens you have collected. You can also change the access to your case so that only you, your neofriends and you, or everyone can see them. In the preferences screen you can also change the skin colour of your Collector's Case. The case also has a Favourites and Quick List icon, which are explained by the Help icon. If you'd like to see more information about a specific token, click on or hold the cursor over that token. 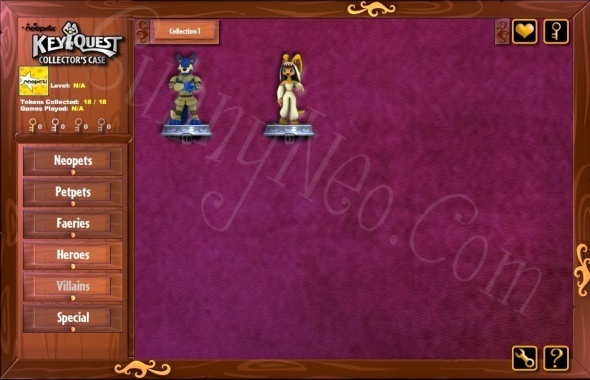 A box will pop up displaying the character's name, the token's alignment, where to get the token and other tidbits of information. If you want to add a token to your favourites or Key Quest quick list, you can do that from the info box as well. Just select the appropriate options! Clicking this icon displays the twelve tokens you've chosen as your favourites! You can remove tokens at any time to replace them with new favourites. Clicking this icon displays the twelve tokens you've chosen to use in your Key Quest quick list. 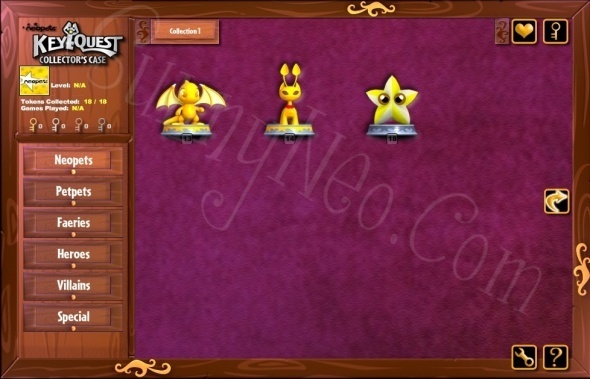 You will have access to these twelve tokens when joining a Key Quest game. Clicking this icon displays your collector's case preferences. Here, you can select your collector's case theme or choose your privacy settings. Clicking this icon displays this help dialog, which you've already figured out. 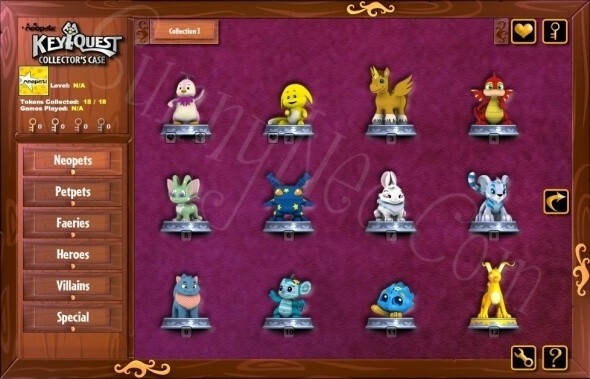 Due to a glitch we saw a full Collector's Case of tokens instead of an empty one, therefore we can grant you a sneak preview of all the 18 tokens neopets made to start with.